"Bob Johansson has just sold his software company and is looking forward to a life of leisure. There are places to go, books to read, and movies to watch. So it's a little unfair when he gets himself killed crossing the street. The safest place for Bob is in space, heading away from Earth at top speed. Or so he thinks. Because the universe is full of nasties, and trespassers make them mad — very mad." One interesting element of the story is how the US becomes a theocracy, led by Christian extremists. Wow. Parts of it reminded me of a Simpsons episode where Ned Flanders became the ruler of the world and anybody who stepped out of line was forced to endure "Re-Neducation." I have only two criticisms of the book. First, I was hoping to find the book's title spoken as dialog by a character in the book. If it was there, then I missed it. And second, the story ended kinda abruptly. I would have enjoyed a few more of the plot threads getting tidied up. 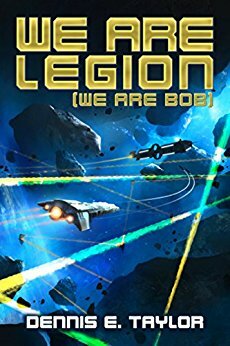 I just received the next book in the Bobiverse trilogy, For We Are Many. I'll listen to that on an upcoming drive to Utah.